A new Saturday night singing contest will let the audience decide who gets through and who goes home. All Together Now will see both groups and solo singers perform before "The 100", a collection of singers from a range of musical backgrounds. The more members they coax onto their feet, the higher score the contestant will receive. 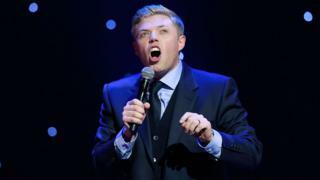 Comedian Rob Beckett will host the BBC One programme, which will begin its six-part run next year. "All Together Now is going to be the best thing to happen to Saturday night... since they invented Sunday morning," he said. "I could not be happier or more excited to be a part of it." The show will be made up of five hour-long heats leading up to a grand final that will see two acts compete for a cash prize. A trailer for the show released earlier this year promised it would contain "nail-biting tension", "spine-tingling performances" and "mind-blowing augmented reality". "This isn't the search for the next big pop act," said James Fox from production company Remarkable Television, part of Endemol Shine UK. "We're looking for performers from all kinds of musical backgrounds and with all levels of experience who think they can give [a] brilliant performance." All Together Now should not be confused with All Together Now: The Great Orchestra Challenge, a nationwide search for the best nationwide orchestra that aired on BBC Four in 2016. Here's how Rob Beckett confirmed his involvement on his official Twitter feed.